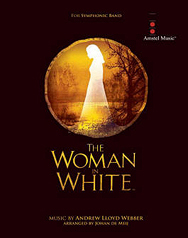 Whether The Woman in White by Lloyd Webber will ever equal the success of The Phantom remains to be seen, but the music is definitely as exciting as Collins’ original book. Johan de Meij welded together the best songs into a striking whole, and created a worthy rendering for the concert stage. Bass Drum, Tamtam, 2 Cymbals.